The FCCLA Career Connection program guides youth to link their options and skills for success in families, careers, and communities. Through individual, cooperative, and competitive activities, members – discover their strengths, target career goals, and initiate a plan for achieving the lifestyle they desire. Career Connection guides students to develop, plan, carry out, and evaluate projects. The projects improve the quality of life in six (6) units. Students focus activities on different aspects of career development. Students can choose a unit, then plan and carry out related projects that strengthen their awareness of skills needed for careers. INTEGRATE Work and Life – Manage interconnected roles in families, careers, and communities. 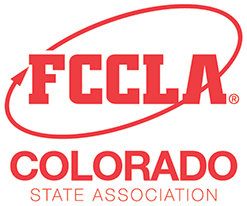 Colorado FCCLA offers two types of state recognition to chapters that complete Career Connection projects.